This Thai version of fried calamari is crisp and seriously delicious - and you won't believe how simple it is to make. If you're a fan of Greek calamari, you'll love this recipe. 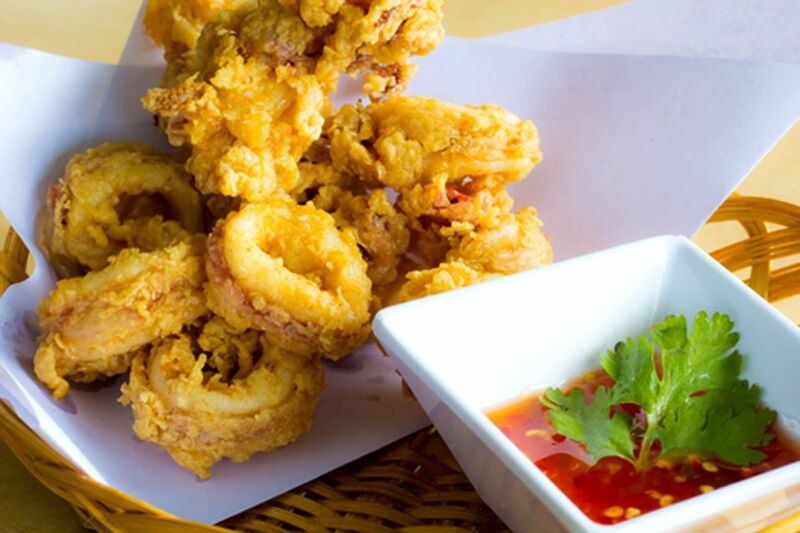 As the recipe will demonstrate, fried calamari needn't be as difficult as it sounds - simply cut the squid into rings, dip into a simple flour and spice mixture, and fry. Serve it up with Thai sweet chili sauce and dig in. Place squid tubes horizontally in front of you on a cutting board. Using a sharp knife and cutting towards you, make slices about 1/2 inch wide. This will create nice-size rings. Pour oil into a small or medium-sized frying pan. The oil should be at least 1 inch deep. Turn heat to high or medium-high, until the oil begins to bubble or "move" from the bottom of the pan. To test if oil is hot enough: using a pair of tongs, dip one of the calamari rings into the oil. If it sizzles and begins to cook, the oil is ready. Place as many rings into the oil as can comfortably fit at one time. Fry about 1 minute, then turn the rings over to cook on the other side. Turn heat down to medium to prevent oil splattering. The calamari should turn a light golden brown. Avoid over-cooking, or squid will turn rubbery. When rings are done frying, remove from oil and place on a clean kitchen towel or paper towel to drain. Serve immediately while still hot. Serve with Thai sweet chili sauce.